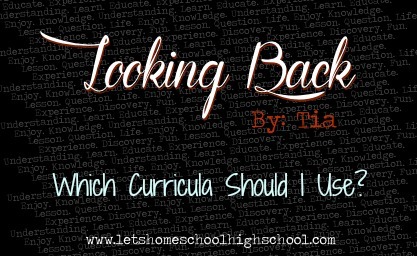 Which Curricula Should I Use? While I was homeschooled, I used all sorts of curricula. I don’t think I ever used the exact same curricula every year. So naturally, it kind of surprised me when I first heard of some students who only used one curriculum for every subject (similar to Time4Learning). What trickery is this? I thought, wondering if such a thing actually existed. It sounded so simple…so easy. But is it? Well, it truly depends on the student. Some students do fantastically with one curriculum for each subject, and they thrive. That’s just what works. For me, and a few other students I’ve known, we mix and match our curricula to what best suits our needs. For instance, I LOVED taking Switched on Schoolhouse’s electives, but their core subjects were absolutely painful for me to do (with the exception of Bible). In the end, I used different curricula for every subject, excluding the electives. It worked well for me to use a mosaic of programs. That’s the beauty of homeschooling. You can stick with one program for every subject if that’s what works, or you can mix and match. You can do whatever best suits your needs and your child’s needs. You don’t have to go by the school system and use what everyone else is using. I’ve even known some homeschool parents to write their own curriculum. Now, I have to say, that sounds extremely intimidating and challenging to me, so I am very impressed with those particular homeschooling parents. But the fact of the matter is: If something works well, use it. If it doesn’t, try something else. Isn’t that awesome? If you would like some suggestions for great curriculum, I highly recommend you check out our high school curriculum directory. You can search specifically for online programs, offline programs, textbooks, secular, Christian, and per each subject. If you have any questions about high school, getting into college, diplomas, transcripts, or anything at all regarding homeschooling, feel free to Ask A Homeschooler! I can certainly relate to the one size does not always fit all, but because I am not rich, I modify my sons' lessons if I need to.